If you’ve been in the market for a Chrysler, FIAT, Jeep, RAM Truck, or Dodge; you might have been introduced to Drive Uconnect. If you are completely unfamiliar with Drive Uconnect, no worries. Today, we will be covering the ins and outs of Drive Uconnect. We will be looking at all of Drive Uconnect unique systems with entertainment, phone, navigation and voice commands. Diving deeper; we will be touching on Drive Uconnects Bluetooth abilities, SiriusXM, 3G WI-FI Hotspots, Satellite Radio, Uconnect controls and all of Uconnects premium sound features. Drive Uconnect is one of the neatest features that FCA Automotive has integrated into their vehicles to capitalize on the automotive industries top of the line entertainment, phone, navigation and premium sound features. With Drive Uconnects entertainment, one can listen to their favorite driving soundtrack, then flip to the news, comedy or their favorite sports programming in an instance. All of this delivered in rich surround sound through multiple sources. Keep in mind, their passengers will also have even more options with movies, games and more. Furthermore, your Uconnect Phone can be integrated with your Navigation, Entertainment and Voice Command systems to provide a beautifully seamless experience. Music volume adjusts automatically so you can hear driving directions and incoming calls, then returns on cue. Voice Command allows you to easily “call Jane Doe” or “redial” as you take the passing lane or negotiate midtown traffic. Prioritize different phones so multiple drivers can connect and call. Uconnect syncs with your compatible phone’s contacts allowing you to call by name and view your contact’s name on the touch screen display. Make and receive calls, listen to and respond to text messages, without taking your hands off the wheel or eyes off the road. Uconnect has teamed up with the leaders in navigation and SiriusXM to ensure you know where you are, where you’re going, and how long it’ll take to get there. Well-designed maps help you slip through traffic, while merging and turning using sensor assisted GPS. Audio directions and voice prompts provide turn-by-turn guidance. Identify points of interest quickly and easily with stunning 3-D graphics and detailed views of landmarks, cities and terrains. Or, simply say an address to get directions with One-Step Voice Destination Entry. No matter where your travels take you, Sensor-Assisted GPS helps ensure accurate positioning for your vehicle — even as you travel through tunnels, indoor parking garages and other areas where GPS signals can become obstructed. Avoid congestion before you reach it by enhancing the navigation on your vehicle’s Uconnect system. With detailed information on accidents, constructions, road closures and traffic speed, you’ll get to your destination more easily than ever before. SiriusXM Travel Link, is certainly the information you need where you need it most. Get detailed weather information including 5-day forecasts, weather maps, and sever storm alerts, plus fuel prices in your local area, movie theater listings, and sports scores and schedules for your favorite teams. So you can stay in the know while you’re on the road. Find a restaurant, airport, museum or department store and get directions there with a simple request. Uconnect makes it so easy, you can change plans on the fly. Lastly, the simplicity of Uconnects controls are top of the line for the automotive industry. One can adjust their seat or their cabin temperature; select a new music station; or make a call without taking their eyes from the road. All your radio, touchscreen and steering wheel controls are designed to be easy to find and easy to use. Change from FM to Satellite, from one channel to another, adjust the volume or change your tracks without ever taking your hands off the wheel. As shown below, a pair of rocker-switch buttons are mounted where your fingers rest on the back side of your steering wheel. Try them once and you’ll never know how you drove without them. Further more, one can control navigation, entertainment, climate, and phone from one place. View album art and artist information, weather, or street maps and points of interest. Get a clear color picture with the Uconnect rearview camera display. View your vehicle’s owners manual on the touchscreen to quickly look up information on your vehicle when you most need it. Personalize your touch screen controls to fit your lifestyle by adding one-touch access to your favorite features and services. All these features and amenities located with in the ease of Drive Uconnect systems. FCA Automotives (Chrysler, FIAT, Dode, Jeep, RAM Trucks) couldn’t of selected a better entertainment system. 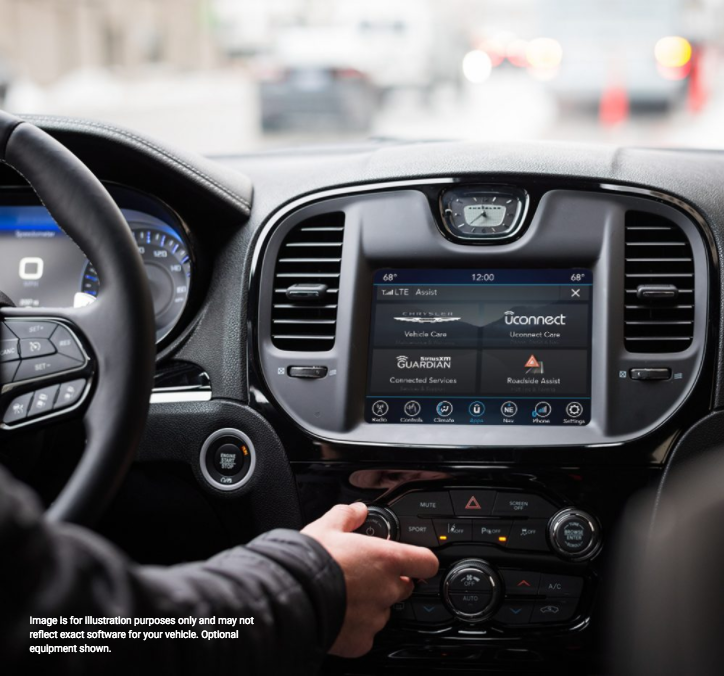 If you’re big on technology, you won’t want to miss out on all the features that Drive Uconnect has to offer in your next Chrysler, Dodge, Jeep, or Ram. It certainly is one thing to talk about the Drive Uconnect, but to see it up close and personal, the experience is unlike any other. If you would like to see Drive Uconnect in person, contact us today and we would be happy to show you everything we can on the Drive Uconnect system. Before coming to Sorg Dodge in Goshen Indiana, feel free to check out our latest vehicles with the Drive Uconnect system on our website: www.sorgdodge.com. Any further questions for us, please feel free to reach out one of our product specialists. We would be happy to assist you with any questions you may have as you pursue your next vehicle with Sorg Dodge.